Exploratory sampling of groundwater in coastal Los Angeles County and Kern and Kings Counties of the southern San Joaquin Valley was done by the U.S. Geological Survey from September 2014 through January 2015 as part of the California State Water Resources Control Board’s Water Quality in Areas of Oil and Gas Production Regional Groundwater Monitoring Program. The Regional Groundwater Monitoring Program was established in response to the California Senate Bill 4 of 2013 mandating that the California State Water Resources Control Board design and implement a groundwater-monitoring program to assess potential effects of well-stimulation treatments on groundwater resources in California. The U.S. Geological Survey is in cooperation with the California State Water Resources Control Board to collaboratively implement the Regional Groundwater Monitoring Program through the California Oil, Gas, and Groundwater Project. Many researchers have documented the utility of different suites of chemical tracers for evaluating the effects of oil and gas development on groundwater quality. The purpose of this exploratory sampling effort was to determine whether tracers reported in the literature could be used effectively in California. This reconnaissance effort was not designed to assess the effects of oil and gas on groundwater quality in the sampled areas. A suite of water-quality indicators and geochemical tracers were sampled at groundwater sites in selected areas that have extensive oil and gas development. Groundwater samples were collected from a total of 51 wells, including 37 monitoring wells at 17 multiple-well monitoring sites in coastal Los Angeles County and 5 monitoring wells and 9 water-production wells in southern San Joaquin Valley, primarily in Kern and Kings Counties. 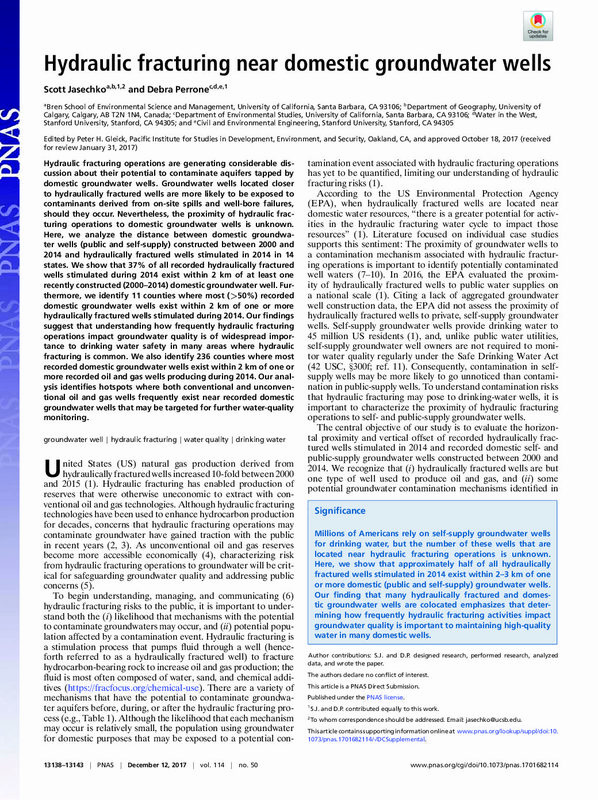 Groundwater samples were analyzed for field water-quality indicators; organic constituents, including volatile and semi-volatile organic compounds and dissolved organic carbon indicators; naturally present inorganic constituents, including trace elements, nutrients, major and minor ions, and iron species; naturally present stable and radioactive isotopes; dissolved noble gases; dissolved standard and hydrocarbon gases, ?13C of methane, ethane, and ?2H of methane. In total, 249 constituents and water-quality indicators were measured. Four types of quality-control samples (blanks, replicates, matrix spikes, and surrogates spiked in environmental and blank samples) were collected at approximately 10 percent of the wells. The quality-control data were used to determine whether the groundwater-sample data were of sufficient quality for the measured analytes to be used as potential indicators of oil and gas effects. The data from the 51 groundwater samples and from the quality-control samples are presented in this report. Hydraulic fracturing, or “fracking,” has generated growing controversy in the past few years. New research from the Pacific Institute finds the real issues around its impacts on water are shared by stakeholders from government to industry to environmental groups – and point to the need for better and more transparent information in order to clearly assess the key water-related risks and develop sound policies to minimize those risks. Much of the public attention on hydraulic fracturing has centered on the use of chemicals in the fracturing fluids and the risk of groundwater contamination. But the new study finds that while chemical disclosure can be useful for tracking contamination, risks associated with fracking chemicals are not the only issues that must be addressed. The massive water requirements for fracking and the potential conflicts with other water needs, including for agriculture and for ecosystems, pose major challenges. Methane contamination of drinking water wells is also a concern according to some field studies, as are the serious challenges associated with storing, transporting, treating, and disposing of wastewater. 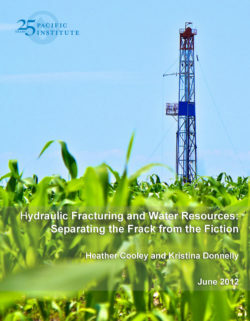 The report Hydraulic Fracturing and Water Resources: Separating the Frack from the Fiction is a detailed assessment and synthesis of existing research on fracking as well as the results of interviews with representatives from state and federal agencies, industry, academia, environmental groups, and community-based organizations from across the United States. Interviewees identified a broad set of social, economic, and environmental concerns, foremost among which are impacts of hydraulic fracturing on the availability and quality of water resources. Hydraulic fracturing operations are generating considerable discussion about their potential to contaminate aquifers tapped by domestic groundwater wells. Groundwater wells located closer to hydraulically fractured wells are more likely to be exposed to contaminants derived from on-site spills and well-bore failures, should they occur. Nevertheless, the proximity of hydraulic fracturing operations to domestic groundwater wells is unknown. Here, we analyze the distance between domestic groundwater wells (public and self-supply) constructed between 2000 and 2014 and hydraulically fractured wells stimulated in 2014 in 14 states. We show that 37% of all recorded hydraulically fractured wells stimulated during 2014 exist within 2 km of at least one recently constructed (2000–2014) domestic groundwater well. Furthermore, we identify 11 counties where most (>50%) recorded domestic groundwater wells exist within 2 km of one or more hydraulically fractured wells stimulated during 2014. Our findings suggest that understanding how frequently hydraulic fracturing operations impact groundwater quality is of widespread importance to drinking water safety in many areas where hydraulic fracturing is common. We also identify 236 counties where most recorded domestic groundwater wells exist within 2 km of one or more recorded oil and gas wells producing during 2014. Our analysis identifies hotspots where both conventional and unconventional oil and gas wells frequently exist near recorded domestic groundwater wells that may be targeted for further water-quality monitoring. A new comprehensive study by the Pacific Institute sheds light on the risks posed when oil and gas exploration and production operate alongside agriculture. “There is growing concern about competition for land and water, and the impacts of soil and water contamination on the food supply and health and safety of farmworkers and consumers,” said Matthew Heberger, the study’s lead author. The disposal of oil and gas wastewater, which contains harmful chemicals, is a particular concern for agriculture. Disposal in unlined percolation pits poses a significant risk of contaminating groundwater resources that may, in turn, be used by agriculture. While this practice has been banned in several states, it is still widely used in California’s Central Valley, one of the nation’s most important agricultural regions. There are also serious deficiencies in the way California regulates the underground injection of wastes – current practices are not sufficiently protective of freshwater aquifers that may be used as drinking water or to irrigate crops and water livestock. 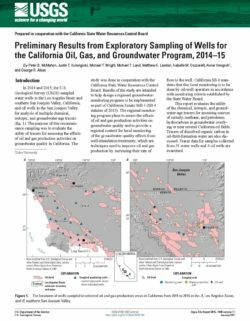 In 2014 and 2015, the U.S. Geological Survey (USGS) sampled water wells in the Los Angeles Basin and southern San Joaquin Valley, California, and oil wells in the San Joaquin Valley for analysis of multiple chemical, isotopic, and groundwater-age tracers (fig. 1). The purpose of this reconnaissance sampling was to evaluate the utility of tracers for assessing the effects of oil and gas production activities on groundwater quality in California. The study was done in cooperation with the California State Water Resources Control Board. Results of the study are intended to help design a regional groundwater monitoring program to be implemented as part of California Senate Bill 4 (SB 4 statutes of 2013). The regional monitoring program plans to assess the effects of oil and gas production activities on groundwater quality and to provide a regional context for local monitoring of the groundwater-quality effects from well-stimulation treatments, which are techniques used to improve oil and gas production by increasing their rate of flow to the well. California SB 4 mandates that this local monitoring is to be done by oil-well operators in accordance with monitoring criteria established by the State Water Board. 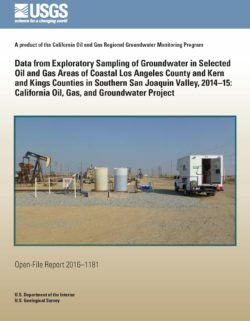 This report evaluates the utility of the chemical, isotopic, and groundwater-age tracers for assessing sources of salinity, methane, and petroleum hydrocarbons in groundwater overlying or near several California oil fields. Tracers of dissolved organic carbon in oil-field-formation water are also discussed. Tracer data for samples collected from 51 water wells and 4 oil wells are examined. Enhanced oil recovery (EOR) and hydraulic fracturing practices are commonly used methods to improve hydrocarbon extraction efficiency; however, the environmental effects of such practices remain poorly understood. 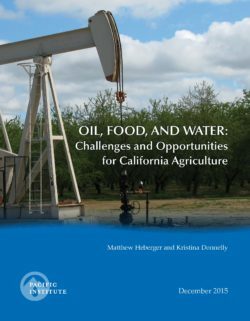 EOR is particularly prevalent in oil fields throughout California where water resources are in high demand and the disposal of large volumes of produced water may affect groundwater quality. Consequently, it is essential to better understand the fate of injected (EOR) fluids in California, and other subsurface petroleum systems, as well as any potential effect on nearby aquifer systems. Noble gases can be used as tracers to understand hydrocarbon generation, migration, and storage conditions, as well as the relative proportions of oil and water present in the subsurface. In addition, a noble gas signature diagnostic of injected (EOR) fluids can be readily identified. 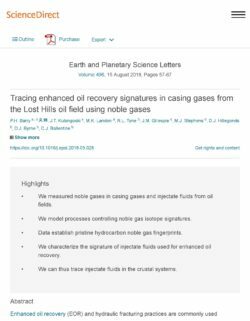 We report noble gas isotope and concentration data in casing gases from oil production wells in the Lost Hills oil field, northwest of Bakersfield, California, and injectate gas data from the Fruitvale oil field, located within the city of Bakersfield. Casing and injectate gas data are used to: 1) establish pristine hydrocarbon noble-gas signatures and the processes controlling noble gas distributions, 2) characterize the noble gas signature of injectate fluids, 3) trace injectate fluids in the subsurface, and 4) construct a model to estimate EOR efficiency. Noble gas results range from pristine to significantly modified by EOR, and can be best explained using a solubility exchange model between oil and connate/formation fluids, followed by gas exsolution upon production. This model is sensitive to oil–water interaction during hydrocarbon expulsion, migration, and storage at reservoir conditions, as well as any subsequent modification by EOR.